Phil at Warrimoo: DIY Super-Efficient Fridge Uses 0.1 kWH a Day - Can it really be that good? DIY Super-Efficient Fridge Uses 0.1 kWH a Day - Can it really be that good? I was skeptical that a chest freezer could be modified to perform the function of a refrigerator and only use 0.1 kWh per day. The home site for this 2005? modification is here. Firstly, the chest freezer selected is a very efficient one to begin with. The VestFrost SE255 is rated as a 5-star, 247L chest freezer that has been tested to AS/NZS4474 to use 237kWh per year. AS/NZS4474, as I understand it, operates the freezer at -15C in an ambient temperature of 32C. It probably cost Tom around $1500. So this chest freezer uses, according to the standard test, 237/365 or 649Wh per day. It's dimensions are 1260 mm W x 850 mm H x 600 mm D displacing a volume of 643L. Allowing for a compressor void of 600 mm x 300 mm x 300 mm, the thickness of the sides and door must be about 135mm. So this freezer does have some serious insulation to keep it cool. The basic conversion is to add another thermostat device that keeps the inside of the freezer at somewhere above freezing so it becomes a fridge. Tom, the author, set the internal temperature to about 5.5C on average. Tom is of the opinion that this idea works because chest freezers have better insulation and that when the door is opened, cold air does not rush out. Tom is right, but the real reason that his fridge consumes so little power is due to the temperatures he is operating it in. Chest freezers, especially the SE255, do have thicker insulation. 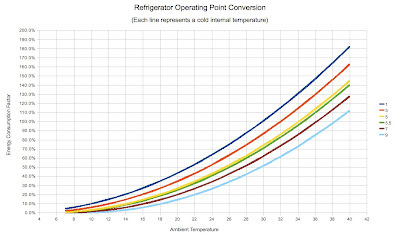 Vertical refrigerators do loose cold air when the door is opened. But if this chest freezer were to be stood on end so the cold air could drain away, the fridge would only use a small fraction of 1Wh of energy to cool the ambient air back down to 5.5C. If the freezer is empty and all the air is replaced then the freezer needs to cool it down by 12.5C in Tom's case. 247L of air weighs about 0.32 kg. The heat capacity of air is about 1000J/kg/K. So the fridge needs to remove 4000J to cool this air down to 5.5C. If the motor efficiency (M.eff) is 90%, Heat is 4000 J, T.hot is 291.15K and T.cold is 278.65 K and the the electrical energy required is 199J or 55mWh (that is 55 milli-Watt hours) - a small amount. Others have noted this small amount also. Now, the warm air may cool a little upon entering the fridge and this cooled air may also drain away, but since the 'energy' lost is so low it makes little difference. The real reason for the low energy use is the operating temperatures: average ambient of 18C and internal temperature of 5.5C on average. By my calculations, and I am no expert here, the freezer would consume just 6.6% of the energy it does when tested to AS/NZS4474. So it should use 0.066 * 649 = 43Wh. Tom stated that the fridge used 103Wh on the first day and that 30% of this was during the stocking/re-arranging period. So my math does not seem to be too far out. What would happen if we operated an energy efficient vertical fridge at Tom's temperatures? Let's pick an Electrolux ERM4307. It is a 6 star 400L fridge (actually it is better than that but the star scale only goes to 6) that is tested to consume 250 kWh per year or 685 Wh per day when operated (closed) at 32C with in internal temperature of 3C. Its volume is about 887L. Again allowing 63L for the compressor, the insulation is probably about 120mm thick. By my calculations it would use just 18.4% of 685Wh which is 126Wh per day and the fridge is about 70% larger inside than the SE255. So the chest freezer is still better, but a good vertical fridge can use very little energy too in Tom's environment. Electrolux also make a vertical freezer. The EFM3607 which is tested to use 403kWh per year which is 1.1 kWh per day. When operated in Tom's environment it should use just 6.6% of 1.1kWh which is 72Wh per day. This fridge/freezer pair will set you back roughly $3600. So, to reduce your fridge/freezer running costs you need to start with an efficient fridge and freezer. Then keep them in a cool place with good ventilation. If you want to you can raise the internal set point to further reduce running costs - I would stay under 8C and definitely under 10C. Select the inside temperature line, draw a line up from the ambient temperature axis to the internal temperature line and read off the energy factor (as a percentage). To use it, just multiply your fridge's daily/yearly energy consumption by this percentage. The maths fails to take into account the compressor is running while the door is open in an upright. The compressor has to run almost every time the door is opened. Where in a chest version, it is far less likely. Do the maths for the upright having the door open for 30secs 20 times a day, rather than the once. The logic makes more sense than the maths can prove. I think in a well organised chest fridge set-up with a 'busy' fridge, it has to use less power. This is already well established for freezers. Why not fridges? The math is never perfect since there are many variables, but it does provide a useful model of the system. The fridges I have owned don't run the compressor when the door is open just because the door is open (but I'm sure you didn't mean that). I think a key point that I and other's before me are making is that air has such little thermal mass that it takes virtually no energy to change it's temperature. But what if I do take your advice and calculate the energy consumption of the fridge with the compressor running for the duration of 30 seconds, 20 times a day? 30 x 20 is 600 seconds per day - 10 minutes. The fridge motors, that I have experience with, run at about 200W. 200W for 10 minutes is about 35 Wh. A fridge would use somewhere between 250Wh and over 1kWh of energy per day, so 35 Wh is somewhere between 14% and a few percent of the total daily energy consumption. So for an energy efficient fridge this would make a noticeable difference, but you probably wouldn't notice the extra energy consumption on a larger, less efficient fridge. My fridge and freezer have solid shelves and drawers. These are designed to minimise air flow when the door is open, so not all the cold air drops to the floor and the speed of the air is resisted and slowed by the shelves and drawers. My old fridge had grill-style shelves - but worse, it had a 12W heater running non-stop to prevent icing! The logic as I see it is that for the lowest energy consumption, keep the fridge/freezer in a cool place (well ventilated too) and keep it internally as warm as you dare. For my old fridge, I disconnected the defrosting heater and put the fridge on a timer to defrost it from time-to-time by artificially lengthening the on-off cycle which allowed the frost on the evaporator panel to melt away. Chest fridges would be better. In Australia and I guess elsewhere, kitchens are designed for upright fridges so the market for a chest fridge would be small. As far as I know, Tom hasn't published any long-term data. I have an unmodified 400L fridge that uses, on average, 360Wh per day. Tom's uses less than half the energy per Litre and I still maintain that this is due to his 18 degree ambient temperature and thick insulation. It goes back to the old quote of 'Lies, damn lies and statistics'. It does boil down to probably needing to purchase a more modern energy saving appliance design (but only after the failure of your current one). And then operating it sensibly. Take everything with a 'pinch of salt'. There is some truth in there somewhere. I thing it good product .soon it will reach the market….